Koto Culrue Salon is Japanese ８tatami room for cultural classes in Kyoto near Kinkakuji (Golden pavilion). and also the place for foreign people & Japanese to communicate through “Cultural Exchange”. We have some hand made classes here tourists also can join. And we are happy to help the artists to have small exhibition here. 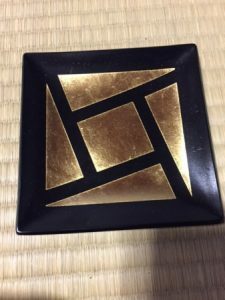 Hands-on Gold Leaf Experience !! Shin ans his father are both craft men of Gold leaf with National qualification. After the long practicing, they finally can be a craft men. 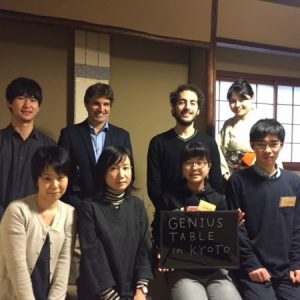 Unfortunately, people who has such special techniques are becoming less in Japan because of the shortage of demand nowadays. I imagine much more cheaper plates and kitchen ware are available recently, so many of traditional craft work are disappearing. It’s same as Kimono, Japanese traditional clothes. We can often find some tourists wearing kimono in Kyoto, but the material for lent is usually not silk. 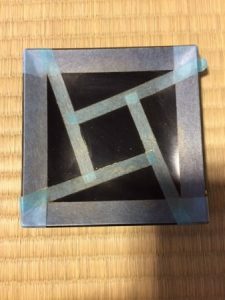 Although we try to use silk sash (obi) for Kimono experience here as much as possible… the number of craft men for weaving are getting less and less in Nishijin Kyoto. I wish I could help them a little. If we experience how to make it , we can notice its beauty or interesting arts. 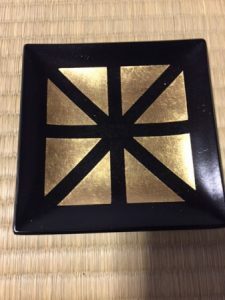 Let’s make a plate with Gold leaf near Golden Pavilion!! First, put tapes on the plate. You can make your original pattern! This pattern is also nice. If you use this for some sweets of nuts, it’s better to place some paper on the plate since it’s not washable. It must be the great memorial plate of visiting Golden Pavilion in Kyoto. We have started the lesson of unique Japanese calligraphy lesson called “Kantei-ryu” ! In other words, it is “the letter of Kabuki”, which is the traditional theater of Japan. 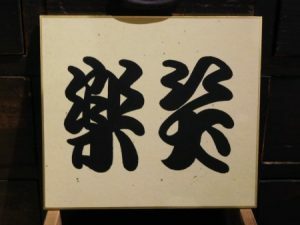 “Kantei “is the name of the founder of this unique writing in Edo period(1779) , and “ryu” means ” the way of・・・” . 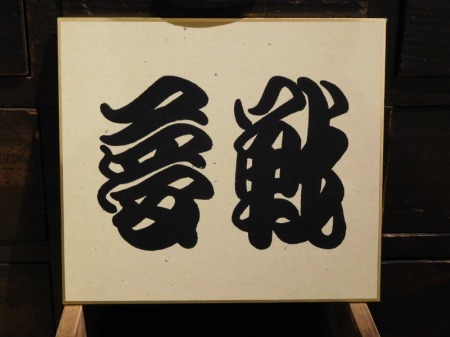 It’s more like “ink painting” more than calligraphy, but still traditional way inherited since Edo period (1779~). The history of “Kantei-ryu” have started sine 1779, when one of the Kabuki theater “Nakamura” had been suffering from the less audience. *Just in case….Kabuki is Japanese traditional theater, one of the Important Intangible Cultural Properties in Japan. Kabuki Theater Nakamura ordered the master of calligraphy to make a sign board to attract customers, since there were no internet or TV in those days. Master Kanroku created the fantastic board, so “Kantei ryu” came from his name Kanroku. Because of his great work, theater Nakamura got a lot of audience. Even know his way of writing has been used for Kabuki theaters in Japan. For example, we can see many name plated of Kabuki actors are displayed in front of the Kabuki theater Minamiza Kyoto in every December. 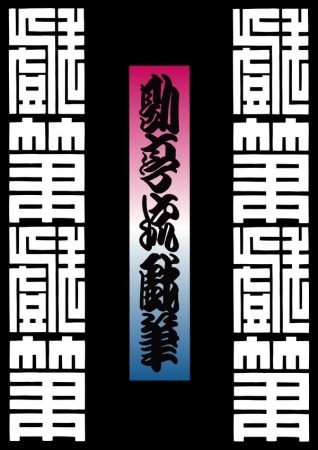 The letters are all written in Kantei-ryu. 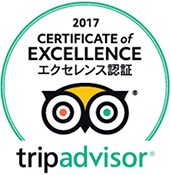 Is it different from Japanese Calligraphy? At first glance, it seems like just printing, but all written by hand!! 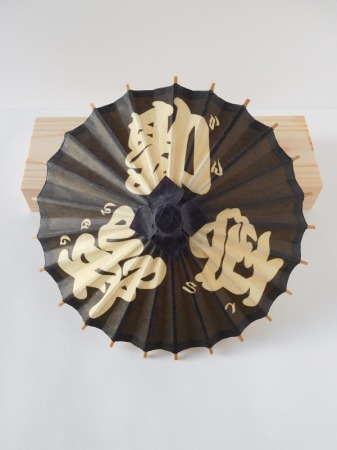 This style is created by the Calligraphy master, but too unique to say Japanese calligraphy. It’ more like “ink painting”. Of course, the way of writing is also different from ordinary one. ・We don’t need to use traditional Japanese paper for the practice. You can use the ordinary paper in your country. ・Need to write the frame of each letters at the beginning. ・Don’t stand the writing brush, but sliding on the paper. They don’t make ink bleed or slight touching. Why…. 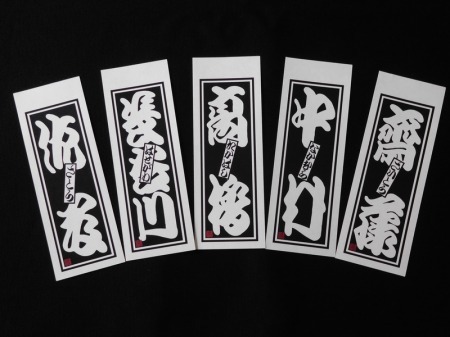 This way of writing represents the warm wish for Good luck and ”Fully booked” for theaters of shops. To welcome the audience, they don’t make the brush out side of the frame, but inside of letters. He has 10 years experience since he had started “kantei-ryu” writing. 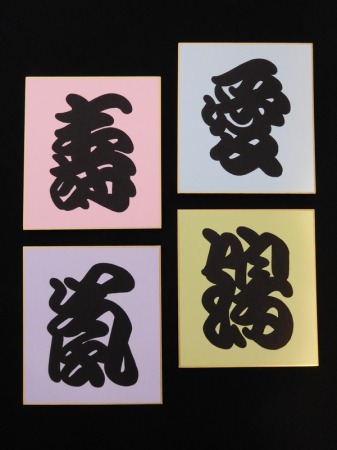 He has been learning ordinary Sho-do, Japanese calligraphy since he was a child, but had a rest for 7 years. After graduating the university, he had met “Kantei-ryu” unique writing, and decided to learn it. which is often said “more like drawing than bush writing”. ↑You can complete this in the lesson. 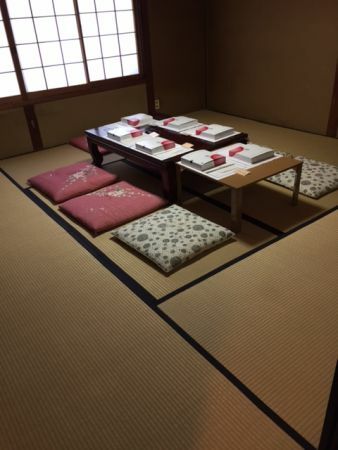 ★ We have tea ceremony lesson from 11:45 in the same building.